Metacomet Daylight Lodge merged into this lodge, 04/18/2006. On December 5. 1992, R.W. William J. Rogers, D. D. G. M., Hyannis 32d District, opened a District Deputy Grand Master" s Lodge for the purpose of instituting Cawnacome Sunshine Lodge. 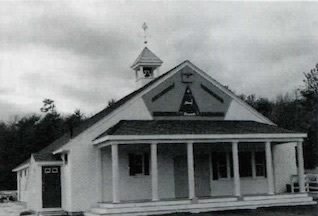 This is the fifth Daylight Lodge to be organized under the jurisdiction of the Most Worshipful Grand Lodge of Masons in Massachusetts. The first order of business was the reading of the dispensation of the Grand Master followed by the reception of the appointed officers of Cawnacome Sunshine Lodge. Immediately following was the reception of M. W. Edgar W. Darling, then Grand Master. M. W. Bro. Darling was received by R.W. Bro. Rogers and escorted to the East where he gave a few brief remarks. R. W. Bro. Rogers installed the officers. He was assisted by Wor. John Trottier, D. D. G. Marshal; Wor. Donald G. Frommeyer, D. D. G. Secretary; R. W. Robert Pann, D. D .G. Chaplain; and Wor. Myron C. Bigelow, Organist. In attendance at the installation were 125 charter members. There are 175 charter members of the Lodge. The following officers were installed: R. W. Kendall G. Jones, P. D. D. G. M., Master; Wor. Stanley G. Robinson, Senior Warden; Wor. Richard F. Grant, Junior Warden; Wor. Robert F. Jones, Treasurer; Wor. William K. Turner, Secretary; Wor. Allen J. Malesco, Chaplain; Wor. Calvin R. Lessard, Marshal; Bro. Peter E. Stone, Senior Deacon; Wor. Hiram J. Jones, Junior Deacon; Bro. William H. Haskell, Jr., Senior Steward; Bro. Richard E. McKenna, Junior Steward; Bro. Waldron H. Boch, Inside Sentinel; Bro. George J. Hood, Tyler; and Wor. Myron C. Bigelow, Organist. Following the close of the Lodge, members and guests went to the Weary Travellers Club House at Monument Beach where an excellent roast beef dinner was served. The members of Cawnacome Sunshine Lodge are planning to break ground this spring to build a new Temple. The Lodge has already performed Degree work and has received six new applications for the Degrees. No truer words have been spoken than on the afternoon of July 16, 1994, when in the Lodge it was said "Behold the Temple is nearly completed." The Lodge room was complete with Officers' stations, lights and fans, carpeted floor, seats for members, and air conditioning installed and working. The first Candidates to be Raised in this new Lodge were Bro. Howard Charles Hanscom and Bro. Robert Warren O'Neil. Jr. R. W. Peter R. Smith, D. D. G. M. Hyannis 32nd District and R. W. Kendall G. Jones, Presiding Master Raised the two new Brothers. 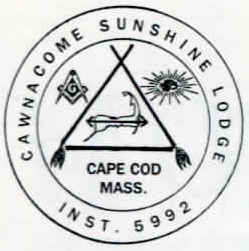 On November 18, 1995, M. W. David W. Lovering, Grand Master of Masons in Massachusetts, officiated at the formal dedication of Cawnacome Sunshine Lodge. He was assisted in the impressive and emotional ceremony by R. W. Robert H. Hartley, Deputy Grand Master; R. W. Arthur E. Johnson, Senior Grand Warden; R. W. William Manchester, Acting Junior Grand Warden: M. W. David B. Richardson as Grand Secretary; R. W. Carl Gordon, Acting Grand Treasurer; Wor. David Catten, Acting Grand Marshal; R. W. Rev. John R. Higgins, Grand Chaplain; Wor. Edgar L. Kleindinst, III, Senior Grand Deacon; Wor. Thomas M. Connors, Grand Steward; and Bro. Norman Nichols, Organist. R. W. Kendall G. Jones was the Architect of the building and assisted in the ceremony of examining the building before dedication. R.W. Bro. Jones was the first Master of Cawnacome Sunshine Lodge when it was Instituted on December 5, 1992. He was also the first President of the Weary Travelers Club when the members decided to build a Masonic Lodge to meet as a daylight Lodge. The Weary Travelers Club was created in DeWitt Clinton Lodge on April 2, 1968. The purpose was to promote Freemasonry and to date they have given over $200,000.00 to local charities, the Masonic Home, and the Shrine Hospitals. The first officers of Cawnacome Sunshine Lodge, U. D., were: R. W. Kendall G. Jones, Master; Wor. Stanley M. Robinson. Senior Warden; Wor. Richard F. Grant, Junior Warden: Wor. Robert F. Jones, Treasurer; Wor. William K. Turner, Secretary; Wor. Allan J. Malesco, Chaplain; Wor. Calvin R. Lessard, Marshal; Wor. Peter K. Stone, Senior Deacon; Wor. Hiram G. Jones, Junior Deacon; Bro. William H. Haskell, Senior Steward; Bro. Richard E. McKenna, Junior Steward; Bro. N. H. Block, Inside Sentinel; Bro. George J. Hood, Tyler; and Wor. Myron C. Bigelow. Organist. This new Lodge on Valley Bars Road in the village of Monument Beach. Bourne. MA. is truly laudable. "The building is a physical expression of our deepest beliefs, that is to say - Brotherly Love, Friendship and Charity." While true the above expression does not adequately describe the effort made by so many from conception to completion. The hard work and determination by the members tugs at the heart to attempt to explain what took place. One hundred eighty five Master Masons gave $300.00 each to start the | building fund. R.W. Kendall G. Jones, Master Builder, took out permits and acted as architect and superintendent the work. The necessary letters and important paperwork were completer to have the Lodge chartered. Brethren came together in force to assist in erecting the Lodge building. Following the dedication ceremony in the Lodge, a reception was held at the Weary Travelers Club which included a sumptuous menu, with music and dancing. The good Lord willing, Cawnacome Sunshine Lodge will exist for many years for the good o all mankind. This page was last modified on 30 April 2018, at 14:44.